It’s a little ironic how much I boycott back-to-school preparations until the very last second. I know that at the end of the summer I’ll be pretty much shoving the kids out the door for their first day of school (don’t forget your first day of school picture printables! ), but until then, we do not speak of school, supplies shopping, or new outfits. Come April, I’m wondering why I don’t homeschool, so that we can sleep in until noon. Come August 15th, I’m wondering why they don’t offer year-round school that includes breakfast, lunch and dinner. It’s an intricate dance in our home. While racing past the aisles and aisles of beautiful school supplies (Elmer’s glue 65% off— SCORE! ), trying to pretend that they aren’t calling to me, tempting me with their perfect order and sharpened tips, I had an epiphany: I love sharpened pencils most of all. And an idea started to take shape in the form of a fun back-to-school cupcake in a cone. Then I was racing down other aisles, grabbing ingredients as fast as my two little hands could grab them, giddy to get started, nervous that it wouldn’t turn out as cute in the real as it was in my mind. Sharpened pencils were tempting me, sure, but in another form this time. A tasty form. Scroll down for FREE PRINTABLE LABELS and instructions for how to make these adorable back-to-school treats! Combine your cake mix, water, eggs and oil into a medium mixing bowl. Mix together for 30 seconds on low and 2 minutes at a medium speed. Set your ice cream cones into a cupcake/muffin tin (like we did with the Unicorn Poop Cupcake Cones). Carefully pour batter into each ice cream cone, until you have approximately 1 inch remaining from the top, which allows for the cupcakes to expand while baking. Taking care not to tip or spill, place your cupcakes in the preheated oven. The cupcakes are done when a toothpick comes out clean, which is anywhere from 20-25 minutes. You can start this frosting recipe while your cupcakes are baking, so when they are cooled this is ready. Just make sure you store in the fridge! Add pudding and powdered sugar in a medium mixing bowl. Whisk in milk for 2 minutes, until smooth and well combined. Place into a piping bag fitted with a circle tip and place in the refrigerator. Once cupcakes are completely cooled, and your pencil labels are in place (instructions below), pipe onto the cupcakes and top with a Hershey’s Kiss. 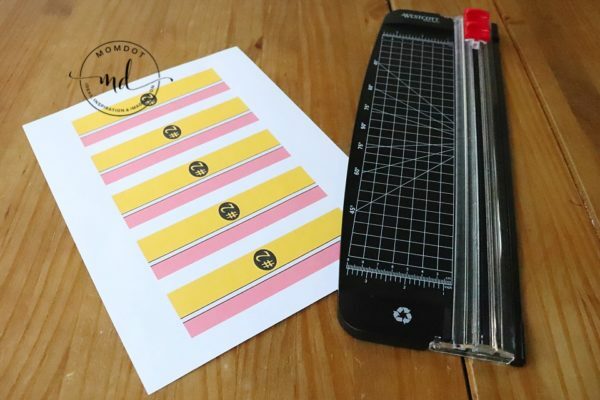 Once you’ve printed off the labels, gather your paper cutter or a pair of scissors, and a glue stick, and get ready for your treat to start taking real shape. These labels work best for the regular sized ice cream cones, not the jumbo size. If you’ve made your cupcakes with the larger cones, make sure that you allow for a little extra white space on one of the sides of the label, so that you can have an overlap for the glue. Using your glue stick, or some other form of glue of your choosing, glue approximately 1/4″ in along the entire edge of one side of the label. Wrapping the label around the base of the cone, overlapping the glued edge with the unglued edge on top, and pressing slightly to secure. With the label secured and your cupcakes frosted, top with the finishing touch, the thing that inspired these back-to-school treats: The Sharpened Pencil Tip Hershey’s Kiss! 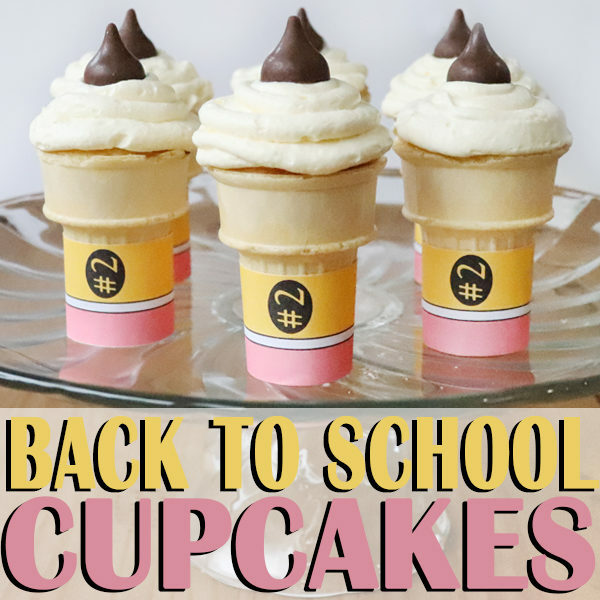 Start the school year off "write" this year with these fun back-to-school cupcakes! Combine your cake mix, water, eggs and oil into a bowl. Mix together for 30 seconds on low and 2 minutes at a medium speed. 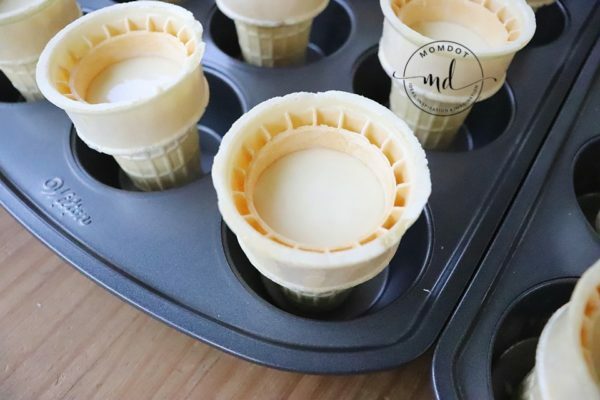 Set your ice cream cones into a cupcake/muffin tin. 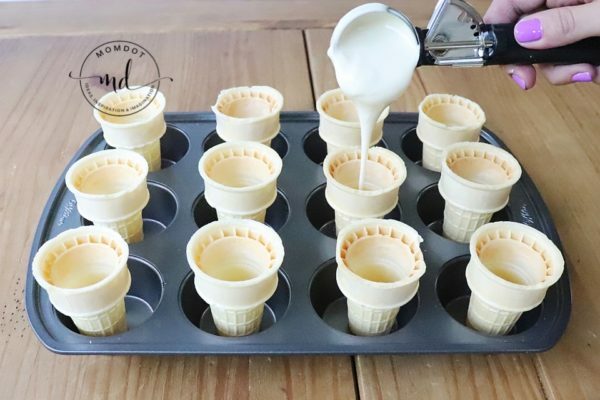 Pour your batter into each cone, until you have approximately 1 inch remaining from the top, which allows for the cupcakes to expand while baking. Add pudding and powdered sugar in a mixing bowl. Whisk in milk for 2 minutes until smooth and combined well. Place into a piping bag fitted with a star tip and place in the refrigerator. Once the labels are printed and cut out, secure around the base of the cupcake cone with glue. Frost the top of the cake, finishing the whole thing off with a Hershey's Kiss. CHECK OUT OUR OTHER CUPCAKE CONE IDEAS! I hope your first day of school, whether public or at home, is a day filled with anticipation, joy, and love. So grab your pencils, and let’s get this school year off to the “write” start!